Like churches and hospitals, places of purpose, with distinct rules and behaviours, there is a special atmosphere in a train station that I find difficult to resist. For most, the train station is a point of departure or arrival, a place to spend as little time as possible. For others it is their place of work, for others still a place to sleep or beg. Rarely is it a place to visit. This would seem to be particularly true of the Gare Montparnasse. There is no history here (or rather the history has been pulled down and built over), no soaring iron and stone from the railway's golden age and not even the transitory pull of a shopping centre or a decent restaurant. Spend some time walking through, around and above this concrete hulk though and you'll find many surprises. The curious thing about today's Gare Montparnasse is that it is situated a few hundred metres from the station it replaced, an admittedly rather dull and austere building originally constructed in 1852. Indeed, the only thing of interest that seems to have happened in the station's early years was to have a locomotive plough through one of its eyes and drop down onto the street below. Much more interesting was an annexe of the station, the new Maine terminus that was added in 1929. 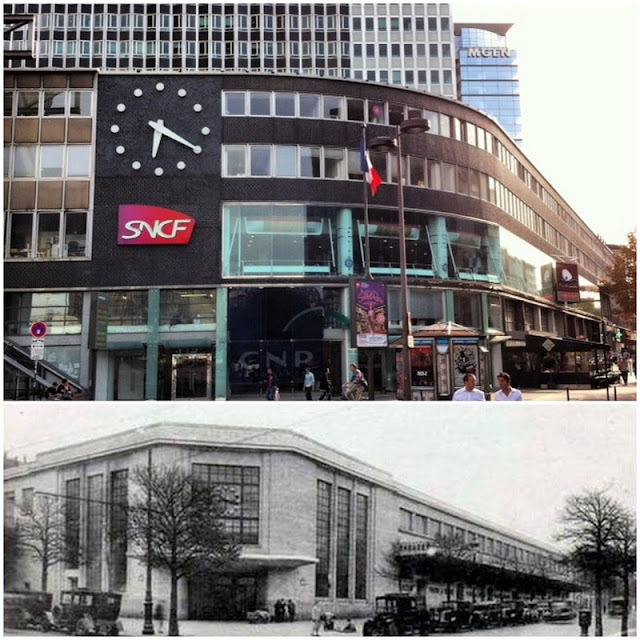 Designed by architect Henri Pacon (who became a specialist in railway architecture - his somewhat reminiscent station building in the city of Le Havre still stands), it was an elegant, art-deco influenced structure...that lasted less than 40 years! In an era of little sentiment it was pulled down at the same time as the original station building when the new Gare Montparnasse was built at the end of the 1960s. Seemingly nothing of Pacon's building survived, but looking more closely there is definitely an echo of his design in the wing of the newer building that stands in the same place, and the clock is very similar. Is it the same one? Which brings us to today's building. 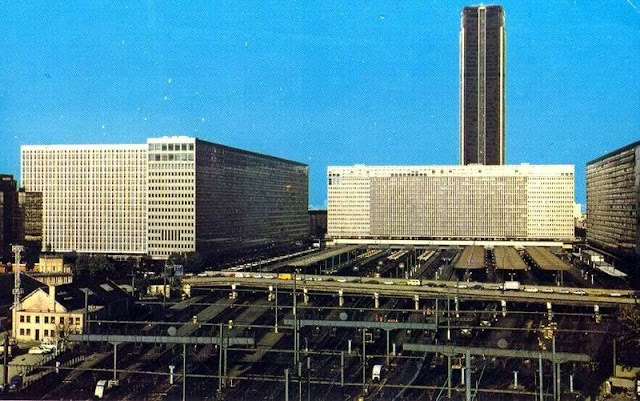 Whereas stations were previously clearly built for only one purpose (with the exception of the odd hotel), Montparnasse is a multi-functional mash-up of trains, offices and residential blocks. Slotting into gaps in these units are also car parks, garages, a park, a museum and...a chapel! The Chapelle Saint Bernard, accessible via a rather discreet doorway near the main entrance to the station, is the only chapel to be found in a train station in Paris. Sitting underground, encased in concrete and with very low ceilings, it has a distinct cavelike atmosphere. The forecourt of the Montparnasse station is the usual kefuffle of arriving and departing travellers, buses and taxis, but you can almost feel the silence as you push the entrance door to the chapel and wander downstairs. The chapel plumped for a minimalist design when built in 1969, but it did incorporate a couple of railway related features. Both the round tabernacle that hangs on one wall and the three legs of the altar were made using old railway sleepers,a knowing nod to the chapel's location from sculptor Pierre de Grauw. On Sundays at 9.30am there is also a weekly 'messe des voyageurs', and passing travellers are apparently welcome at any time. However, no-one was around when I wandered through, and a security guard gave me a very strange look when I returned back up to the surface. 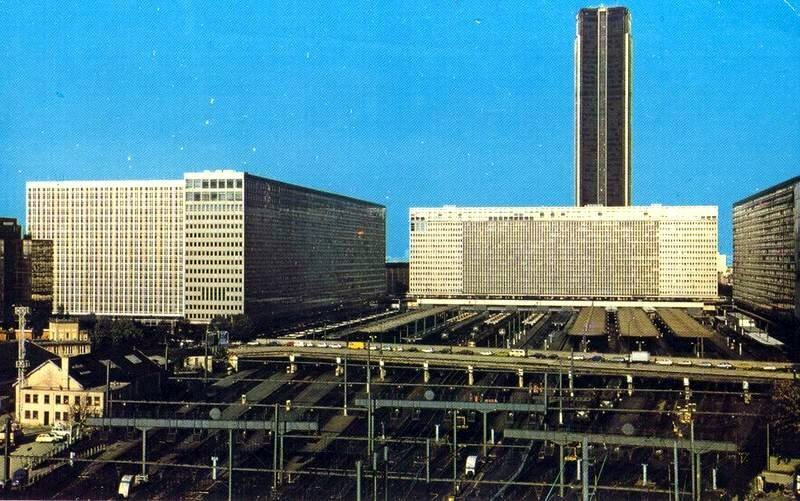 The station itself is a jumble of concrete platorms, escalators and staircases, with a glass facade that looks back onto the lumbering Montparnasse tower. Once modern, much of the station building already looks very dated today, but one feature remains timeless. Victor Vasarely's Op Art may scream of the 1960s, but the multi-coloured murals that stand on either side of the main departure lounge fit their concrete surroundings to perfection. In an environment that would surely wish to see itself as avant-garde, it is amusing to see the old mechanical information boards still in operation here. Each time a train leaves, it seems to take forever to flip over the letters and numbers of all the following services, but there is a certain charm to it, and perhaps a message that we shouldn't always be in a rush to get somewhere. It also offers a frisson of anticipation as a platform number slowly ticks over, then passengers forget the message to take their time and quickly rush to be first on the train. Throughout the station, staircases lead in all directions. I see one somewhat enigmatically labelled 'Exposition', and have to see where it goes. It stands alongside five air vents that point upwards like a hand of fat fingers curving off in different directions, and pops out into the corridor of an office block. Walking past locked meeting rooms and other perpendicular corridors, it eventually leads to the Jardin Atlantique, an esplanade that was added above the platforms of the station in 1994. The first point of interest here is a museum with surely the longest name in Paris, if not the whole of Europe; the "Musée du général Leclerc de Hauteclocque et de la libération de Paris – Musée Jean Moulin." Why should there be a museum celebrating both the resistance movement and the liberation of Paris at this particular location? 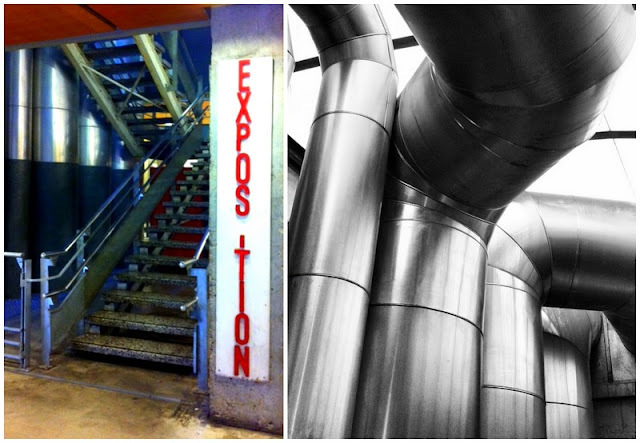 According to the city of Paris - which runs the museum - there are two reasons. Montparnasse was Jean Moulin's favourite part of Paris, but the second explanation seems to stem from a misconception. It is said that the General Von Choltitz signed Germany's capitutaltion document in the (old) train station when Paris was liberated on August 25th, 1944, and that there is even a photograph to prove this. However, the real document had actually been signed earlier at the Prefecture de Police in the city, and the document Von Choltitz was signing in the photograph was a completely unrelated one. Whatever the reasons, the museum obviously has a valid role to play, even if it is difficult to find and housed at the bottom of an office block in a couple of rather dreary rooms. The jardin itself though is another matter. What a surprise to find an expanse of grass above the platforms, not to mention a tennis court and small gardens where fruits and vegetables are slowly ripening in the sun. Sitting up here on a bench you could quite easily forget that you were in a train station if it wasn't for the regular tannoy announcements wafting up through the air vents. A rare view of the station before the Jardin Atlantique was built. The various facets of the Jardin Atlantique today. 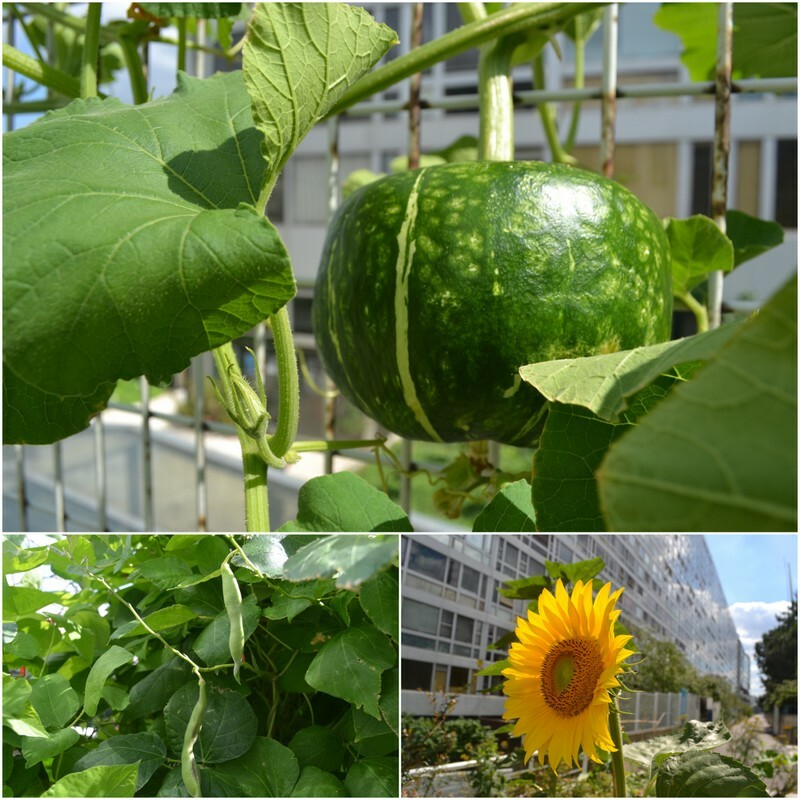 Above the congested platforms, you can find beans, squashes, raspberries and rhubarb! The garden is surrounded on all sides by office and housing blocks, one of which is particularly well-known. The immeuble Mouchotte was built in 1966, and was immediately adopted by left-bank intellectuals and militants. It played an important role in the 1968 uprisings, so much so that Jean-Paul Sartre labelled it 'l'immeuble rouge'. 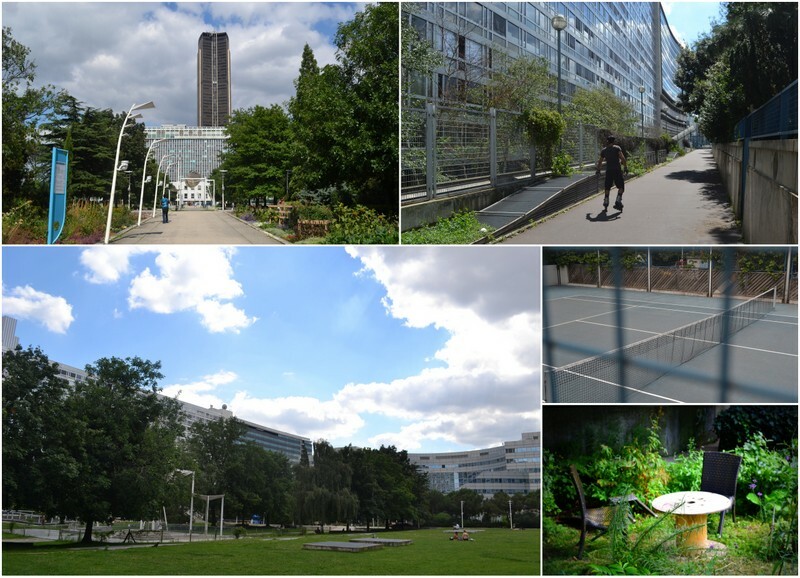 Through the 1970s, the residents of the building continued to involve themselves in various battles, notably fighting against plans to extend a motorway in towards the centre of Paris. Given the perspective that many residents had at the time, across the rail tracks, with an endless procession of trains arriving and departing, it is easy to imagine how they remained attached to a proletarian view of Paris. Now that their appartments look out across a more bucolic landscape, is there still such a militant mindset in the building? I do have an idea, but to me it is besides the point. There is still so much more to explore. A great blog that brought back many fine memories, particularly of the rooftop garden and a postcard Philippa and I sent to our then 3 year old grandson. He loved the train that crashed out of the station. When asked what he thinks happened he thought long and hard and gave a logical explanation. "I think they built the building around the train and had to get it out." What a great post, Adam. I know the Jardin Atlantique of course but had not realised until I saw the photo here that the station used to be open to the elements. I had always imagined it already had a roof and then the garden was just added. It somehow puts it in a different light - as somewhere that robbed the station of fresh air and sunshine, rather than somewhere that added greenery and space. Your American acquaintance captured one of its key features - that it is probably the hardest park in Paris to find - or, it seems, to leave. You are so good at discovering tucked away places! Your text reminded me that "Mouchotte" was also the headquarters of Air-France with very long empty corridors. When A-F was privatised, the end of the month was the only time these corridors were used when the people who's names were on the doors came in to collect their monthly Pay. I suspect A-F made a packet from selling those many floors of long corridors. Not much to do with railways, but a lot with the past of the building.